If a loved one has recently been diagnosed with dementia or Alzheimer's disease, it's only natural to feel fraught with fear and uncertainty about what lies ahead. Fortunately, you don't have to do it alone. This friendly and authoritative guide is here to help you make smart, informed choices throughout the different scenarios you'll encounter as a person caring for someone diagnosed with dementia or Alzheimer's disease. 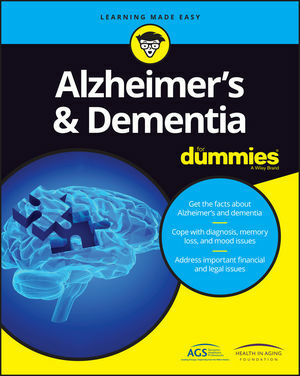 From making sense of a diagnosis to the best ways to cope with symptoms, Alzheimer's and Dementia For Dummies is the trusted companion you can count on as you navigate your way through this difficult landscape. Affecting one's memory, thinking, and behavior, dementia and Alzheimer's disease can't be prevented, cured, or slowed—but a diagnosis doesn't mean you have to be left helpless! Inside, you'll find out how to make sense of the symptoms of dementia and Alzheimer's disease, understand the stages of the illnesses, and, most importantly, keep your loved one safe and comfortable—no matter how severe their symptoms are. Whether you're new to caring for a person affected by Alzheimer's or dementia or just looking for some answers and relief on your journey, this is the trusted resource you'll turn to again and again. The American Geriatrics Society, (AGS) is a nationwide, not-for-profit society of geriatrics healthcare professionals dedicated to improving the health, independence, and quality of life of older people. The Health in Aging Foundation is a national non-profit organization established by AGS.